Heather Martin's trio of RLT het-Albinos from Todd Smith's original 2003 litter. 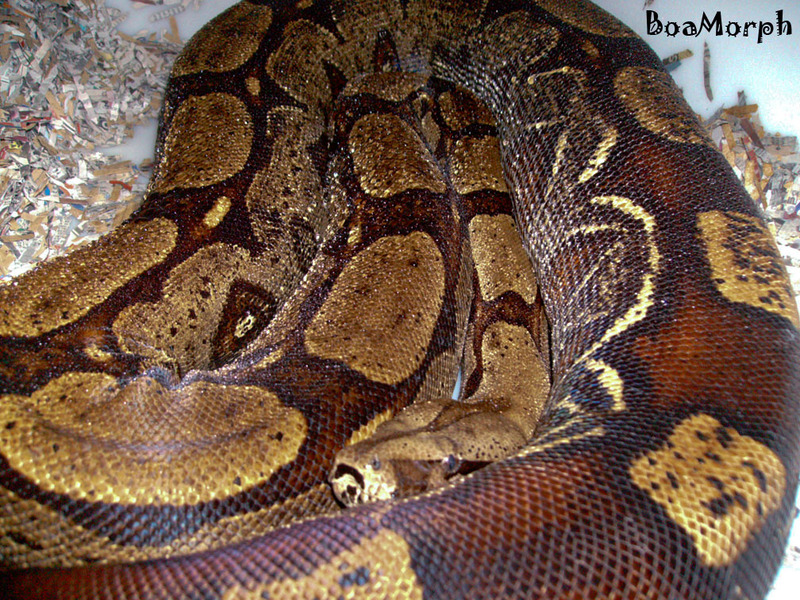 Heather Martin's 2007 breeding of Ruben X Myra produced Dargo, the world's first Roswell boa. Todd Smith produced the original Roswell Laddertail (RLT) litter in 2003. They were not called RLTs by Todd at that time because neither he nor anyone else knew that there was more going on there than just a ladder tail. 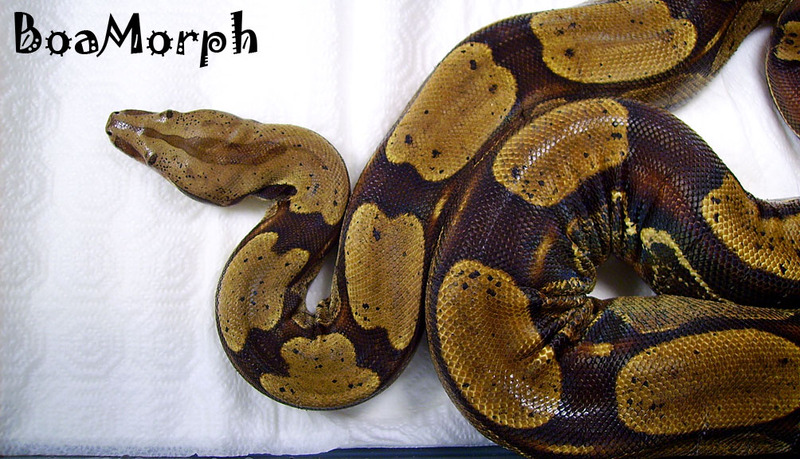 Heather Martin's 2007 breeding of siblings from Todd's litter produced the first Super (homozygous) version that Heather named the Roswell Boa; the heterozygous form with connected patterns and ladder tails later came to be called Roswell Laddertails, or RLTs. 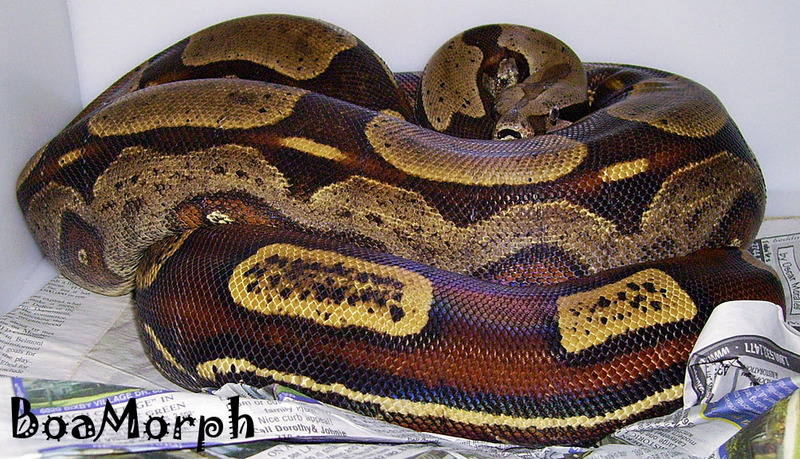 Todd's original 2003 litter resulted from breeding a Kahl Albino to a wild-caught import pure Bcc (Suriname) with a nice connected pattern and ladder tail (it turns out that she was the matriarch RLT). 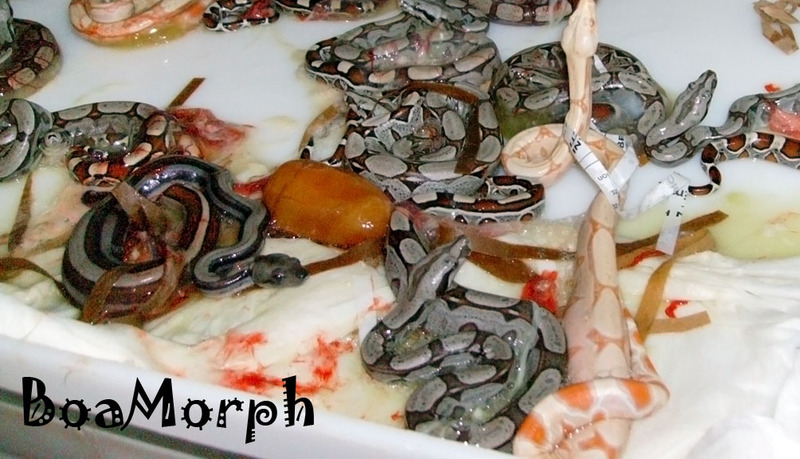 As a result, all of the original RLT stock from that 2003 litter were het-Kahl Albino, and all Roswells/RLTs that were produced later started out as at least 66% possible het-Kahl Albinos (all of the details of the origin and development of the Roswell trait and Roswell/RLT boas can be found at the "Roswell Origins" link on the InfoMorph! page of our website [Coming Soon]). Ever since we first starting working with Roswells/RLTs, we had always been interested in finding a Roswell or RLT possible het-Kahl Albino that we could demonstrate was very unlikely to be het-Kahl Albino through breeding trials and statistical evaluation of the offspring produced (see the "Possible Hets and Statistics link on the InfoMorph! page of our website). If we were successful in that demonstration, we would then be able to breed that Roswell or RLT to a Sharp Albino and open up a whole new world of breeding opportunities for Roswells/RLTs, and without fear of mixing Kahl and Sharp strain Albinos resulting in the production of undesirable mystery boas down the road. A female Hypo RLT 50% possible het-Albino bred by a Groovy Coral Albino RLT proves out het-Albino. 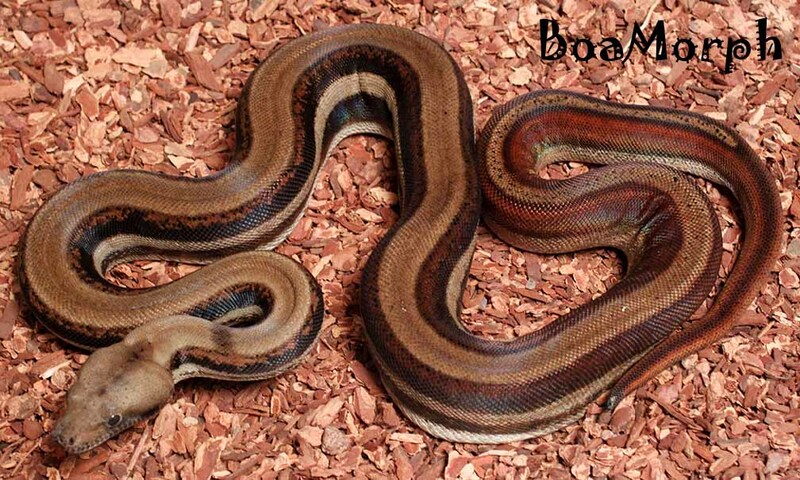 We acquired many RLT 66% possible het-Kahl Albino boas from Heather, eventually purchasing her entire boa collection. But in all of our breeding trials, the RLT 66% possible hets kept proving out het-Kahl Albino- we were doing GREAT on the odds the one time we really didn't want to! was bred to two het-albino females producing a total of 23 babies, none of which was albino. A daughter of the 07 male RLT above, and mother of the 2014 litter pictured above-left. In 2010 we acquired several RLTs from Jason Gonzalez, one of which was a male RLT 66% possible het Kahl-strain Albino that Heather Martin had produced in her first Roswell/RLT litter in 2007. Jason had bred this particular male to a Kahl double-het Sunglow female (Hypo het-Kahl Albino), and produced a litter of 10 babies, none of which was Albino. 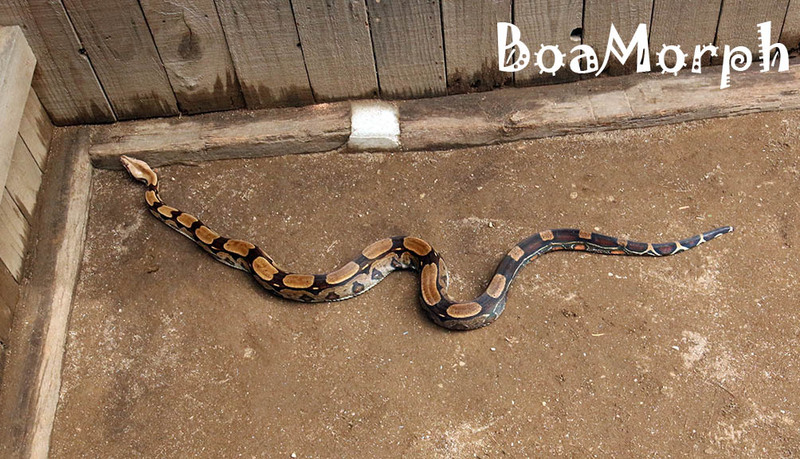 This result, of course, immediately had us very interested in this boa. With that breeding of het-Albino X possible het-Albino, if the male possible het-Albino actually was het-Albino, the probability of getting zero Albinos (k=0) in 10 babies (n=10) was 0.056, or 5.6%; or to phrase it another way, the probability of this male RLT not being het-Kahl Albino based on this litter outcome was about 94.4%. 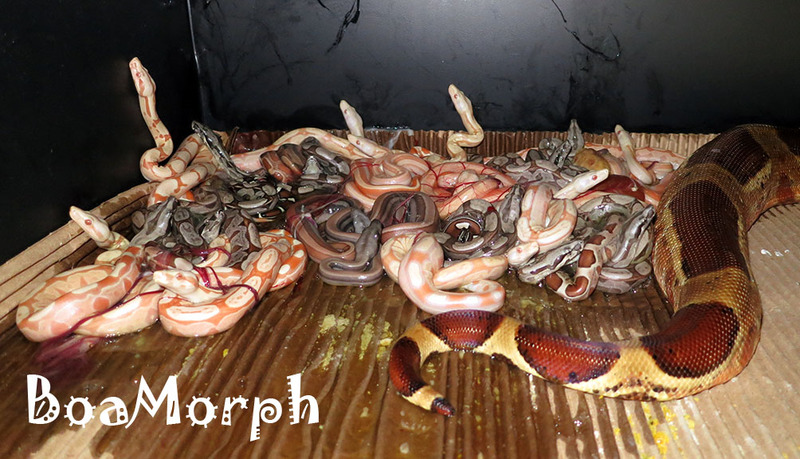 We did not feel that this probability was sufficient to comfortably decide that he was not het-Kahl Albino, and so we decided to conduct further breeding trials with this male and another het-Kahl Albino female here at BoaMorph. resulting in a litter of 13 big babies, none of which was Albino. In 2012, we succeeded in breeding him to a proven het-Kahl Albino female we had raised here from one of our many Groovy Coral Albino litters, resulting in a litter of 13 babies, again with no Albinos. In total this male RLT 66% possible het-Kahl Albino had successfully bred two females that were het-Kahl Albino (q = ¾), and produced 23 babies (n = 23) with no albinos (k = 0). If this male was het-Kahl Albino, the probability of this outcome would be only P23(k=0) = (¾)23 = 0.0013 or 0.13%, equivalent to 13 in 10,000 or just a bit over 1 in 1,000. Finally The Result We Were Looking For! With these results, we were able to conclude that this male RLT was not het-Kahl Albino at a probability (or certainty) of about 99.87%. We decided that we were sufficiently confident in these results to allow us to do what we had long been wanting to do: breed an RLT to a Sharp albino! 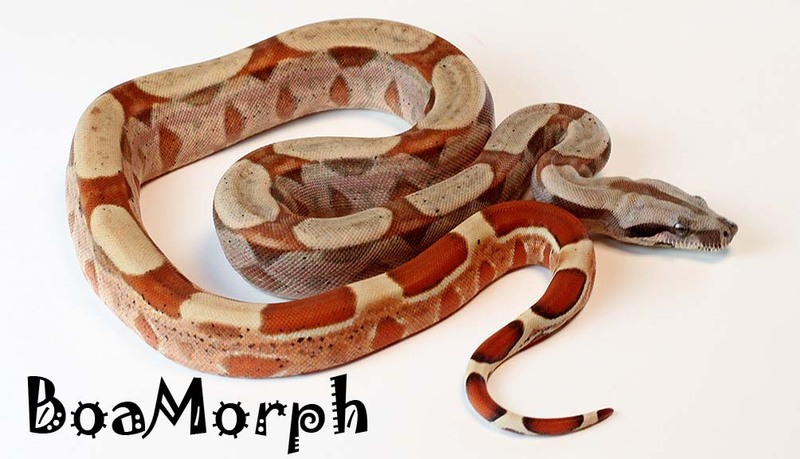 This opened up a whole new world of possibilities for Roswell/RLT breeding, and the knowledge of probability and statistics that we have shared here is what allowed us to do it while minimizing the risk of mixing Kahl-strain and Sharp-strain Albino genes which could have produced undesirable mystery boas down the road. Continue to "RLT het-Sharps and Multiple Fathers"